Many equate the month of January with new beginnings, but for me, new beginnings have always been associated with September. One way I’ve satisfied the serious itch to go back to school every fall is to begin some sort of informal study in an area of personal interest. This September, it’s learning a new language. I first began studying Italian many years ago, but I’ve been away from it for a long while and I miss it. So this year, I’ve decided to make Italian my back to school project. I’ve been puttering away at learning Italian in an on-again-off-again way for years. And I own that I’m still terrible at it—I speak slowly and only in the most rudimentary way, my Italian grammar is deplorable, and I regularly butcher their lovely language. But I love it and every few years I pick it up and continue to dabble away at it. Learning a language from audio CDs and textbooks alone is not easy and sticking with it can be a bit of a challenge. So, for me, the myriad of new language learning apps available for computers, laptops, tablets and smartphones makes learning so much more fun, inspiring me to want to continue on. All sorts of fun apps are now available, from verb conjugation training apps and vocabulary builders all the way up to more sophisticated and comprehensive language programs. Check out your favourite app store to see what’s available in your language of interest. If you’ve ever wanted to try learning a new language but felt daunted by the thought of it, or you weren’t sure whether you would like it enough to invest in an expensive language program like Rosetta Stone or Berlitz, check out Duolingo. It’s a free, multi-award winning program that’s so fun, it’s positively addicting. You can use it online on your desktop or laptop, or you can download the app and play with it on your tablet or smartphone. I love using it on my iPad. It’s available in a number of languages, including French, Spanish, Italian, Portuguese, German and many others. Duolingo is also great for brushing up on a language you might have studied in the past. I highly recommend trying it if you have any interest whatsoever in the languages they offer. And did I mention that it’s absolutely free? 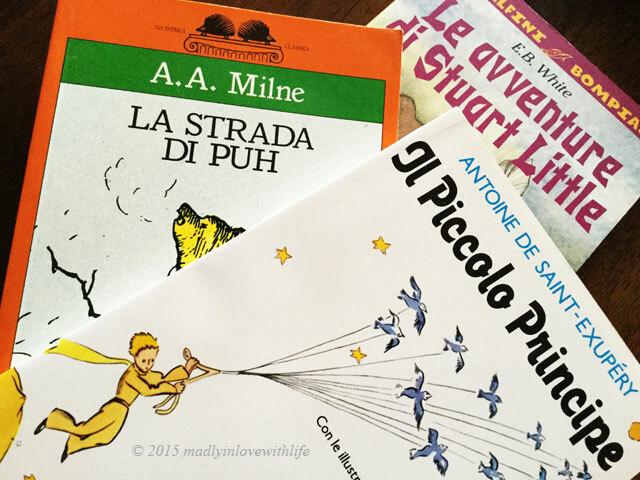 Find one of your favourite childhood books in audiobook format in the language you are learning and just listen. Even if you don’t understand much, listening starts to train your ear to hear the sound, rhythm and musicality of the new language. You’d be surprised at how quickly you can begin to recognize the odd word here and there. Many public domain books in various languages are available for free on iTunes. Loyal Books also has many public domain audiobooks available for free in various languages. You can also track down a print copy of the book you have chosen (in the language you are studying) and follow along with the audiobook. I like to watch Italian movies as a supplement to my studies, both with and without sub-titles. Its great training for the ear. You can find foreign movies in your language of choice at your local library, from Amazon or on Netflix. Another fun way to immerse yourself in a new language is through music. Get some tunes you like in the language you are studying—check out your public library for music or listen to some real radio stations from your country of study. TuneIn Radio is an excellent app which allows you to listen to radio stations from all around the world. To augment my Italian studies, I enjoy tuning into RTL 102.5, a contemporary music station in Rome. And, of course, there’s always YouTube. It’s full of excellent music from all over the world. Also, you can often find the lyrics to the songs you like online, both in the original language and in the English translation. Once you’ve learned the words to your favourite songs, you can sing your heart out in the shower (my apologies to your loved ones…). Try to get your hands on some of your favourite cartoon strips in the language you are studying. 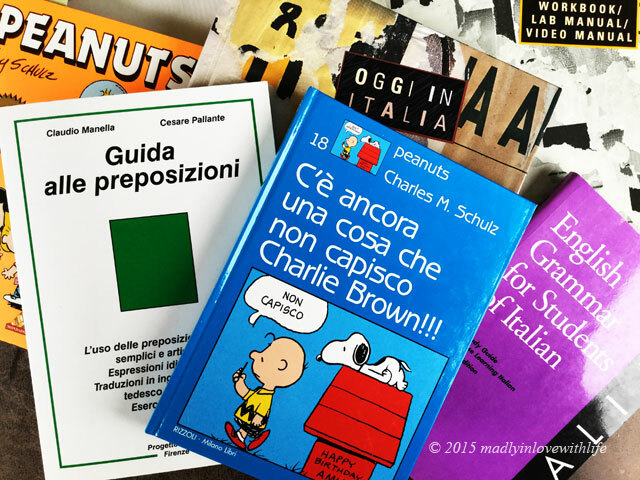 I love trying to read Charlie Brown in Italian. It’s slow going, but the illustrations help and it’s a fun way to learn lots of different idioms. If you are lucky enough to find a friend who speaks the language, bribe them with a cup of coffee or lunch to get some one-on-one practice time. If, like me, you don’t have that luxury, have some fun trying to speak your new language into Google Translate. I have the Google Translate App downloaded onto my iPad and I use the microphone to speak Italian (using the two-way automatic speech translation function) to check my sentence structure and pronunciation. Sometimes, I also like to speak English into Google Translate and it talks back to me in Italian! I guarantee you’ll have a good time. You will laugh a lot, both at your own mistakes and the mistakes that Google Translate makes. Cultivate an open attitude by not needing to understand everything right away. Believe that, in time, everything you don’t quite understand at the moment will gradually click into place as you keep plugging along. Don’t be afraid to make mistakes. Making mistakes is an important part of learning, so embrace them. Keep it light and laugh at yourself a lot! Have fun with it. If you’re not having fun, you won’t learn nearly as much. I love learning. For me, September will forever be associated with learning new things. You may not want to learn a language, but maybe the Back-to-School bug has bitten you and you have a burning desire inside to learn something new—maybe it’s photography, or writing, or cooking, or perhaps it’s something obscure and esoteric. Don’t wait! Sign up for a class, or search the internet for resources to learn at home and have fun learning something new this fall. It’s good for the mind and the soul! Remember: you don’t have to go to a formal school or take a ready-made course to keep on being an inquisitive student of life. Here’s to lifelong learning! a good comeback to learn a new language. I wish you a nice weekend, Jeannie. Like you, the coming of Autumn brings this great feeling of newness and adventures coming my way…and it may be related directly to that feeling of a kid and the start of another school year. This makes it a perfect time to learn something new, and your thoughts of that being a language is perfect. Very cool and 祝你健康，开心！ Nothing quite as nice as lifelong learning Jeannie ~ wish you the best. Take care. LOL, Jeannie! You are the happy optimist! September a fun time because of back-to-school! To me, it is a nightmare… And now that my little girl is fashion conscious, we went to EIGHT stores to look for “fashionable” gym shorts. Arrgghh. Hi Jeannie! I often fondly remember your enthusiasm (and all the help and mentoring) from my first year at UofA. I share that thirst for learning too – but have been finding all sorts of different ways to fill my brain with knowledge. Who knew I’d end up being a hydrographic surveyor’s tech support (or even that there was such a thing as hydrographic surveying) back when I finished university? I’m finding it to be great fun and am learning so much about so many different things! I’ve also been supplementing my learning this past year with online courses – some for interest, some for shaping up my skills. Duolingo was great fun to see how well I’d retained my French (more than I had expected) and other massive online open courses such as Future Learn and edx. I have been relearning calculus through Kahn Academy, which has to be one of the coolest online learning sites I’ve visited – it’s addictive and fun! For your friend who might want to check out a Japanese app, I found these two helpful: Hirigana Learn Japanese (for android by Legendarya / Imaginactiva) which teaches you to write, and http://www.japan-activator.com, which helps build vocabulary and phrases. The app even had a section where you could play common phrases if you were trying to communicate with a Japanese speaker! Very clever! And, in case you wanted any more inspiration about how to become fluent in any language, check out this TED talk: http://www.fluentin3months.com/tedx/ – I’m sure it will motivate you even more! Ah with learning the language you must eat it, sing it, dance it, and that my friend you are doing I am sure. Such an informative post!